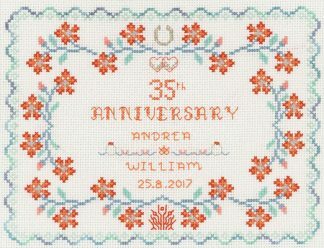 A cross stitch floral 35th wedding anniversary card kit to make a special Coral wedding anniversary gift. The Coral anniversary design has garlands and hearts embellished with glinting green beads. The design is in coral pinks with turquoise highlights and metallic thread to add sparkle. A Floral 35th Anniversary Card for A Coral anniversary with garlands and hearts embellished with glittery green beads. The design is in zingy coral pinks with turquoise accents and metallic thread to add sparkle. 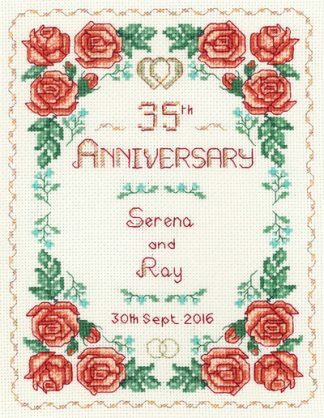 This Floral 35th Anniversary kit has only the best quality materials ~ Zweigart fabric, DMC thread, metallic threads, Mill Hill beads, needles. 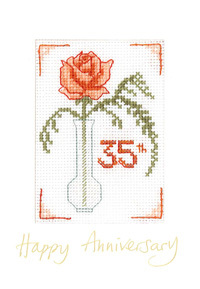 This 35th Anniversary card is designed by Lauren Turner for the Decorative Textiles collection.